My mom had made Ellie’s costumes for her first two Halloweens, but now it was my turn. This was also a special year because it would be Ellie’s first time trick-or-treating. Last year we were in Japan for Halloween and the only event they had was a “parade” at a local mall. This consisted of kids dressed up walking around chanting “trick or treat!” There was no candy. No candy!? But this year we would do the old fashion door-to-door trick or treating. I was very excited! For Chloe’s I just wanted to make something easy and warm. 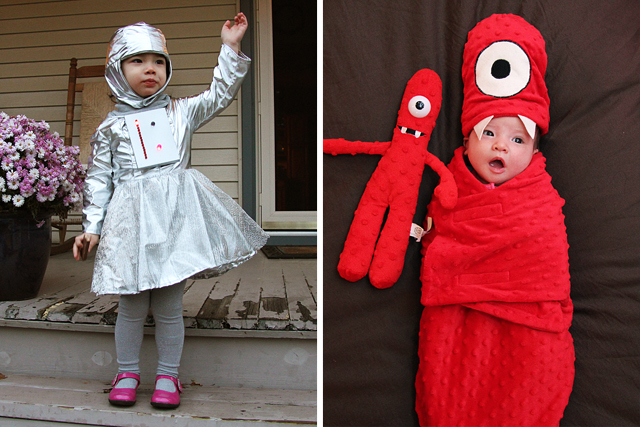 So a Muno swaddler costume seemed to do the trick. She outgrew her hat before Halloween though. By a lot! 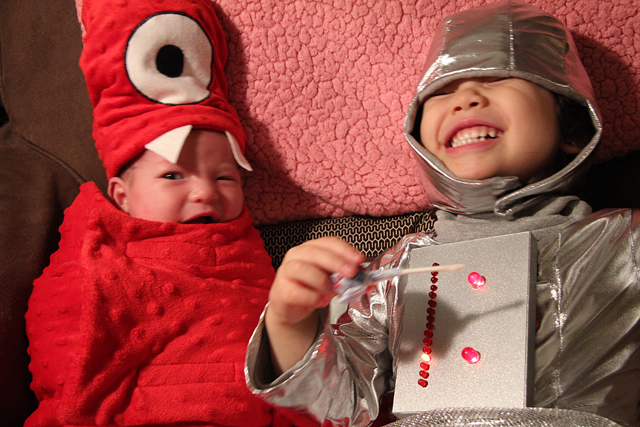 I celebrated Halloween with Chloe as Muno from Yo Gabba Gabba, and Ellie as a robot ballerina (complete with blinking lights!) Or as I like to call it, the bionic ballerina. Ellie seemed to enjoy it and her “twick-o-tweets,” and we had a great Halloween despite the cold and rain. Now to start eating the leftover candy! Chloe’s costume is beyond amazing….and loooove Ellie’s control panel! Great job! Love, love, love the costumes, Matt! Great job! So flippin’ cute! Love the control panel!!!! Matt, the costumes are great and I hardly helped at all !